What is Christmas for the PYM? 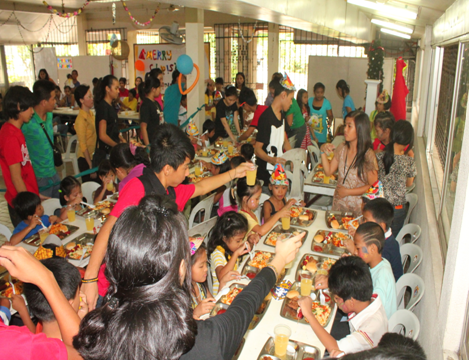 Last December 24, 2011 the PYM held a Christmas party for the less fortunate children of our parish. We came up with the idea of “a day not for ourselves but for those who need it the most.” We all shared our talents, time and treasures to make the event possible. We went caroling to raise funds and set up different committees (i.e., planning, program, logistics, food, and creative). As added preparation, we had a spiritual formation a few days before the party, participated in by the kids and the youth ministry with the help of Ate Cristy and Kuya Vic Vianzon, and Father Luke. We all felt blessed; we all felt that this Christmas was the best. We saw the face of Jesus through these kids. We saw them smile, enjoy like no other and be nothing but themselves. Seeing the kids enjoy the food, the gifts, the presentations and the place, made our sacrifices and efforts all worth it. Christmas is not just about the gifts. It’s about sharing what we have in our own little way. It’s about sharing our most valuable gift which is our time. It’s not true that we made their Christmas special, because it’s the other way around. They made our Christmas unforgettable. “Until one feels the spirit of Christmas, there is no Christmas. All else is outward display, so much tinsel and decorations. For it isn't the holly, it isn't the snow. It isn't the tree nor the firelight's glow. It's the warmth that comes to the hearts of men when the Christmas spirit returns again."